A St. Louis summer is not complete without a trip to the Muny in Forest Park. We certainly had a great time last week seeing Seussical the musical! The weather could not have been better, and the show was full of fun and imagination. 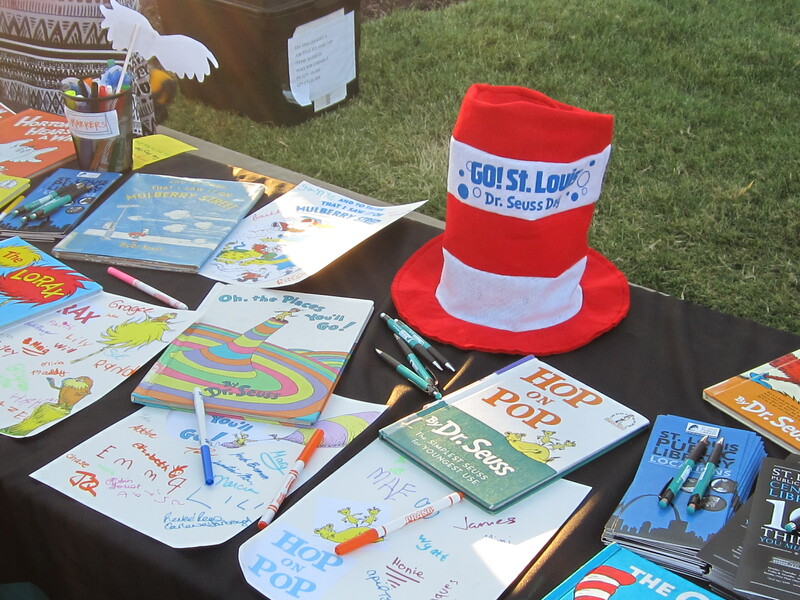 Before the show, the crowd had the pleasure of watching a juggler on stilts as well as stopping by the St. Louis Public Library table to vote on their favorite Dr. Seuss book. The clear winner by a margin of 2 to 1 over every other title was Green Eggs and Ham. The people of St. Louis have spoken! Seussical‘s run may be over at the Muny, but you can still see Grease and Hello, Dolly! this season. Check out some of the Seuss-voting below, and leave a comment with the title of your favorite Seuss book! Schlafly branch’s resident caterpillars turned into chrysalises recently. Soon, they’ll become butterflies! During Schlafly’s butterfly program (August 5th 3:30-4:30pm), kids will watch a video created using 3D scanning technology that shows how a caterpillar developments inside its chrysalis and view a video about the life cycle of a butterfly and butterfly farming. Don’t miss all the butterfly fun! Therapy Dogs are specially trained pooches that excel at putting humans at ease and alleviating stress. 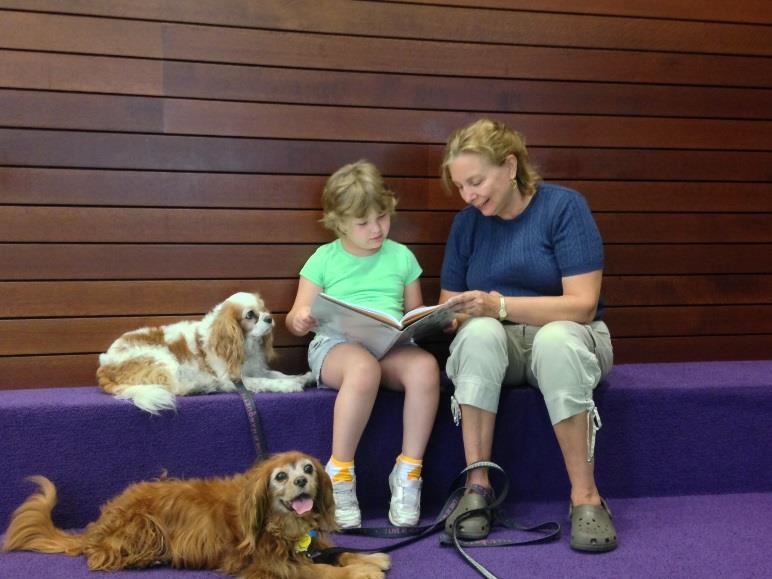 While most commonly used at hospitals and nursing homes, Therapy Dogs also visit schools and libraries to give emotional support to kids who may struggle with confidence in reading. Sander and Aria are non-judgmental listeners who will never critique a beginning reader’s mistakes. Fries says they are especially good with special needs kids. “They are very patient. They are very polite listeners”. Sander and Aria are a breed well-suited to their profession. Cavalier King Charles Spaniels are often used as Therapy Dogs due to their temperament and affection for people. “Cavaliers are lap dogs”, explains Fries “and they keep track of a person’s demeanor”. This gentle empathy is what seems to get kids, even shy kids, to happily read a book to the two siblings. 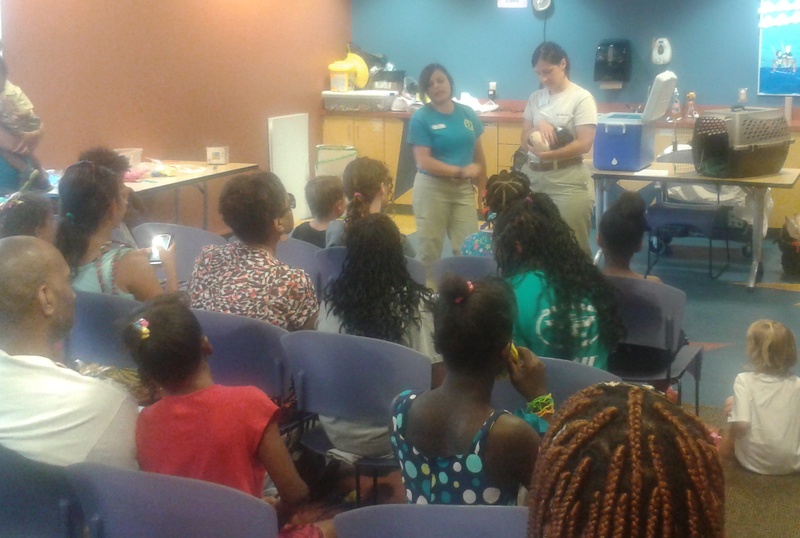 Contact Central Children’s Library at 314.539.0380 for Melanie, Sander and Aria’s current schedule. 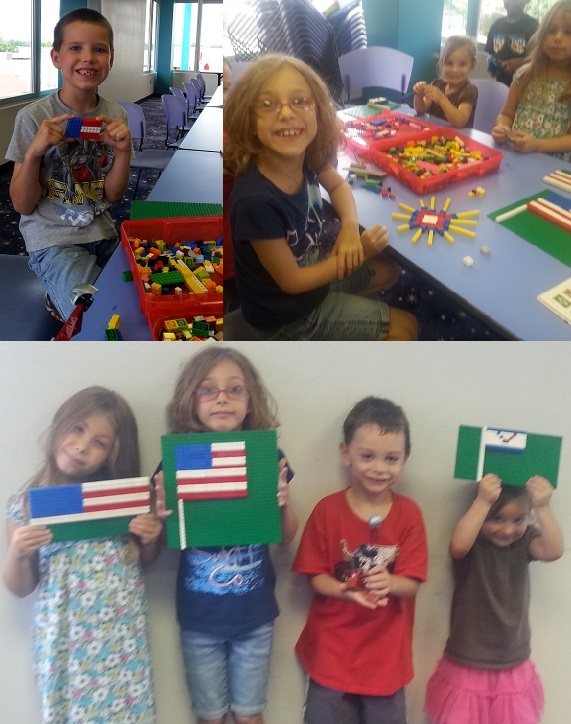 This summer on the second Wednesday of each month, young patrons at Julia Davis Branch have been having fun with Legos. Each time we play we have a different challenge. 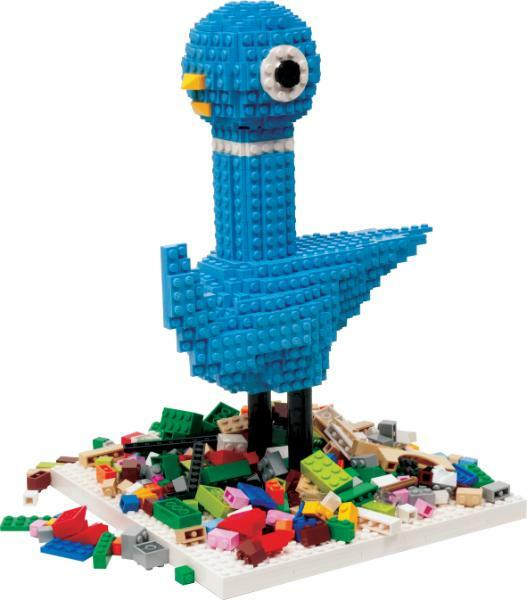 This month, we created an entry for a Lego Education contest called “The Pigeon Builds a Story”. 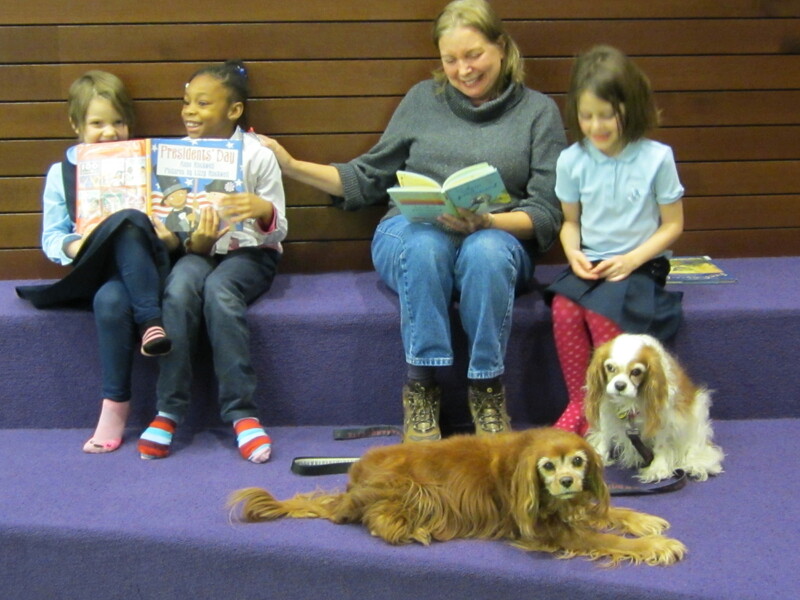 Inspired by Mo Willems’ book “The Pigeon Wants a Puppy”, young patrons at the Julia Davis Branch Library created a spin off story. Pigeon is chased around the house by the big puppy, but is luckily given the chance to escape when a cat comes in to distract the dog. The cat runs up a tree and makes it to safety. The kids worked in small groups to create structural characters to represent each animal as well as the scene. We used the Lego Movie Maker app, a stop motion film tool, to tell their story. Can you “like” our entry on the Lego Education page? The post with the most likes will win the grand prize. The “like” button looks like a turquoise and white star on the top right side of the page. You can find our entry here. If you think this looks like a fun activity, join us next month at Julia Davis (or at many other SLPL locations) to use your creativity with Legos. In 1984, President Ronald Reagan designated July as National Ice Cream Month and the third Sunday of the month as National Ice Cream Day. What better way to celebrate than by cooling off inside your favorite library branch and reading about this cool treat? These titles will have you all screaming for ice cream! How can a contest this sweet turn so sticky? Nancy and her friends think there is nothing more fun than ice cream in the summer. So when they find out that the owners of the local ice-cream factory are hosting a contest, the Clue Crew can’t wait to enter! Contestants must come up with brand-new flavors. And they can use whatever ingredients they want! Nancy is sure that her entry — Clue Berry — will win! But when a friend’s secret recipe goes missing, Nancy suspects that someone not-so-sweet is up to no good. In this title, unwrap the lives of talented Ben & Jerry’s Homemade ice cream manufacturers, Ben Cohen and Jerry Greenfield! Readers will enjoy getting the scoop on these Food Dudes, beginning with their childhood in Merrick, New York. Students can follow their success story from Greenfield’s education at Oberlin College and Cohen’s job at Highland Community School to their various jobs in between. An entertaining sidebar, a helpful timeline, a glossary, and an index, supplement the historical and color photos showcased in this inspiring biography. The owner of the Greenfield Ice Cream Barn has two new partners: her granddaughter Brianna and the horse Butterscotch. Benny frequents the Ice Cream Wagon, run by Brianna with Butterscotch’s help. But who is trying to shut down the Ice Cream Barn? Can an ice cream controversy be red hot? You bet! Here’s a colorful picture book that playfully presents the great debate over who invented the ice cream cone. Who invented the ice cream cone? Ernst Hamwi, a wafflemaker at the 1904 St. Louis World’s Fair, claimed it was his idea. But Arnold Fornachou said his cones inspired Ernst’s! David Avayou reported that he brought the cone back from Paris. And Charles Menches announced that his sweetheart created the dessert. Only one man holds the patent for the first cone-making machine, though, and his claims top them all… In this picture book, Elaine Greenstein shows young readers that history is made by ordinary dreamers — and it can be just as cool and delicious as a fresh cold ice cream cone. Gerald is careful. Piggie is not. Piggie cannot help smiling. Gerald can. Gerald worries so that Piggie does not have to. Gerald and Piggie are best friends. In Should I Share My Ice Cream? Gerald has a big decision to make. But will he make it in time? Funny story about the challenges of doing the right thing. Once you’ve loaded up on books and movies, head home to share a sweet treat. 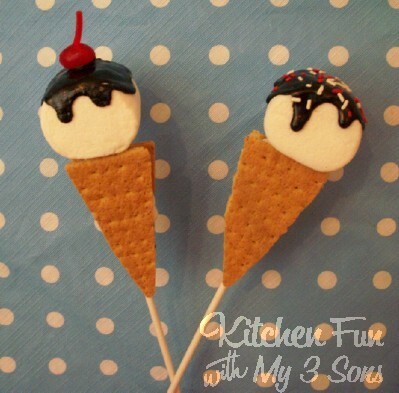 Directions for making these Ice Cream S’mores Pops can be found at Kitchen Fun With My 3 Sons. All SLPL locations will be closed tomorrow in observance of Independence Day. If you’re hunting for some fun, Americana-themed reads, check out these books today, or drop in to check them out when we reopen on the 5th! A humorous look at five of our country’s founding fathers. Provides a biography of America’s first traitor–Benedict Arnold–that reads like an adventure tale, full of heroism, treachery, battle scenes, and surprising twists. John Adams and Thomas Jefferson have differences, but put them aside in the name of friendship. Animals: Live in the Library! 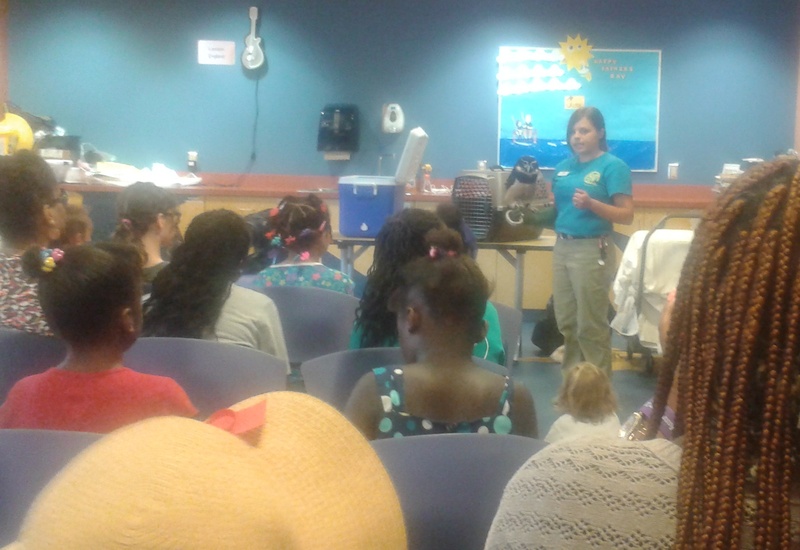 The St. Louis Zoo is bringing some friendly critters to your library!